Are you looking for caregiver service? Seniors who have ongoing health concerns and limitations often prefer to remain in their own home. It can be challenging for aging parents to care for themselves while living alone. 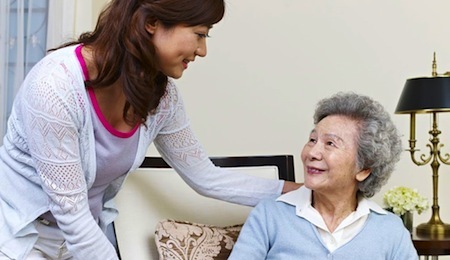 Are you looking for in-home care services for the family members in the comfort of their own home? Self-Help for the Elderly helps make this possible. With a dedicated team of client relations specialists, registered nurses, and caregivers, we offer seniors a variety of affordable, non-medical, and safe in-home care services. All Self-Help for the Elderly’s caregivers have attended and completed a professional training program provided by a certified registered nurse. The curriculum is tailored to handle all kinds of situations, provide companionship, and help maintain a safe environment for the individuals. Our caregivers are fluent in Chinese dialects including Cantonese, Mandarin, Taishanese and Taiwanese. They provide great companionship for the seniors as they are able to visit them as often as needed. Self-Help for the Elderly’s caregiver services is a joint by a team of three: client relations specialists, registered nurses, and caregivers. As you submit a service request, our client relations specialist will contact you at your preferred time and go over your inquiries. Next, we will schedule an in-person interview with you and the caregiver. Caregiver service is categorized as long-term, short-term and temporary (weekend or holiday) assignments. Clients have the choice to select the frequency of the services: weekly or bi-weekly; parts of the day (morning, midday, or evening). A minimum of 4-hour services per visit is required. Please call 415-677-7618 or email homehelp@selfhelpelderly.org. Our client relations specialist shall contact you as soon as possible. The office hours are Monday to Friday, 9 am to 5 pm.